Placing a file from Elvis onto a layout in InDesign with Smart Connection installed is one of the ways of adding files from Elvis to the Enterprise workflow. In addition, the file also needs to be made part of a Dossier. This article describes how to control which action takes place. For more detailed information about performing these actions, see Adding Elvis 6 images to InDesign with Smart Connection installed. Smart Connection for Adobe CC 2014 (version 10.2.6 or higher), Smart Connection for Adobe CC 2015 (version 11.0.5 or higher), or any higher version of Smart Connection. 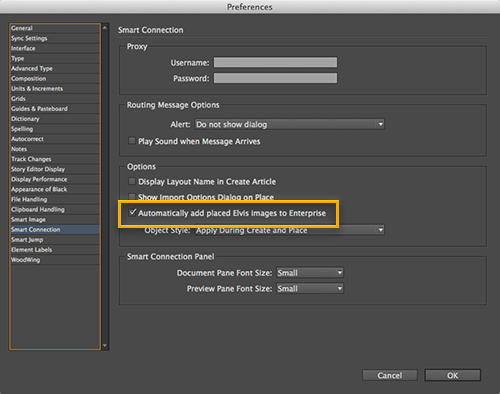 When adding an Elvis image through InDesign, by default it is automatically added to Enterprise. This method is for system administrators who want to make sure that users use a specific method. When setting the method through the WWSettings.xml file, the corresponding Preference in InDesign (see below) is disabled, thereby preventing InDesign users from changing the setting. To enable automatic adding, set Automatic to "yes"; to disable it, set it to "no".